The Northern Illinois Huskies take on the South Florida Bulls on Saturday, September 10, 2016 at Raymond James Stadium. The opening line for this game has USF as 14 point favorites and the over/under was set at 57. This season the Huskies are 0-1-0 against the spread and their over/under record is 1-0-0. The Bulls have an over/under record of 1-0-0 and they are 1-0-0 against the spread. Drew Hare finished with 329 yards through the air for Northern Illinois last week. He completed 24 passes out of 39 attempts for a 62% completion percentage. The Huskies were led in rushing by Kenny Golladay, who finished with 82 yards on 6 rushes. He ended the contest with an average of 14 yards per carry. Kenny Golladay was the team leader in receiving with a total of 144 yards and 10 receptions. He finished the game with an average of 14 yards per reception. As a team in that game Northern Illinois got a total of 19 first downs by way of 6 rushing, 12 passing, and 1 by penalty. They ran 76 total plays for 462 yards for the game. The Huskies ran for 133 yards on 37 attempts. 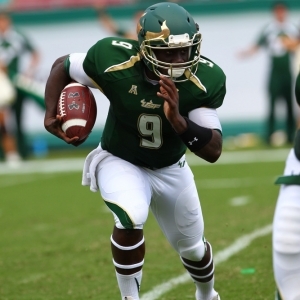 Quinton Flowers finished with 178 yards through the air for South Florida last week. He completed 8 passes out of 18 attempts for a 44% completion percentage. The Bulls were led in rushing by Marlon Mack, who finished with 58 yards on 9 rushes. He ended the contest with an average of 6 yards per carry. Marquez Valdes-Scantling was the team leader in receiving with a total of 79 yards and 3 receptions. He finished the game with an average of 26 yards per reception. South Florida got a total of 22 first downs by way of 10 rushing, 9 passing, and 3 by penalty. They ran 66 total plays for 444 yards for the game. The Bulls ran for 214 yards on 41 attempts. Northern Illinois scores 34 points per game on offense this season, which ranks 57th in Division 1. In the passing department, they average 24 passes on 39 attempts for a 61.5 percent completion percentage this season. They throw for a total of 329 yards per game through the air as well, which ranks them 19th in college football. The Huskies run for an average of 133 yards per game on 37 attempts for an average of 3.6 yards per carry. That ranks them 85th in the nation. They also run 76 plays per contest and average 6.1 yards per play for an average of 462 yards per game, ranking their offense 51st overall this season. The Huskies average 19 first downs per game which ranks them 79th in the country. They accumulate 106 penalty yards per game via 12 penalties, which ranks 8th in the nation. Northern Illinois allows 245 passing yards per game, ranking 88th in D-1, and they allow 40 points per contest on defense, which ranks 108th. They give up 19 completions on 29 attempts per game for a completion percentage of 65.5. The Huskies allow 243 rushing yards per game on 56 carries for an average of 4.3 yards per carry, which ranks their rush defense 111th in the country. Northern Illinois allows 488 total yards per game including 5.7 yards per play, which ranks their overall defense 108th in terms of yards per game. They force 0 turnovers per contest and get flagged for 10 penalties for 100 yards per game, ranking them 119th among D-1 teams. South Florida averages 56 points per game this season on offense, which ranks them 11th in the country. In the passing department, they complete 13 passes per game on 25 attempts for a 52 percent completion percentage. They throw for 230 yards through the air per game, ranking them 61st in Division 1. The Bulls run for an average of 214 yards per game on 41 attempts for an average of 5.2 yards per carry this season, which ranks them 44th on the ground. They also run 66 plays per game and average 6.7 yards per play for a total of 444 yards per game, ranking them 59th in the country on offense. The Bulls get an average of 22 first downs per game, which ranks 59th in the nation. They average 42 penalty yards per game via 4 penalties, ranking them 81st in college football. South Florida allows an average of 165 passing yards yards per game, which ranks 47th in Division 1. Their defense overall allows 20 points per contest, which has them ranked 64th in the nation. They give up 16 completions on 41 attempts for a completion percentage of 39 per game. The Bulls allow 127 rushing yards per contest on 49 carries for a 2.6 average per rush, ranking their overall rush defense 68th in the country. South Florida allows 292 total yards per game for an average of 3.2 yards per play, which ranks 50th in D-1. They force 4 turnovers per contest and 5 penalties for 62 yards in each contest, ranking 87th in the nation.